Scientists believe that dolphins don’t ever fall into a deep sleep; therefore, they probably don’t dream. The bottlenose dolphin (Tursiops truncatus) is a large stocky dolphin around 2.5 – 3.0 metres in length and weighing 200-275 kg. They have a large sickle shaped fin and they can leap right out of the water. The bottlenose dolphins are often seen near the coast – in bays and around harbours, although herds can also be seen far offshore, often accompanying much larger pilot whales. When individuals – usually males – become separated from the social group, they may seek contact with humans. 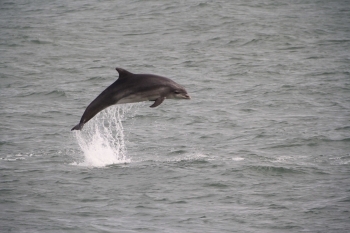 Although the bottlenose dolphin takes a wide variety of schooling fish including herring, mackerel, cod, bass, salmon, and sea trout, in many parts of its range around the world coastal populations are thought to favour bottom-living fish such as mullet, moray eels and flounder. A single calf about a metre in length is born during the summer months, usually between March and September, with the mating having taken place twelve months before. The calf is nursed immediately by the mother, who may be assisted by other females. If necessary, they will help the calf up to the surface for its first breath and the mother may also be assisted if she is weak. The calf is suckled for around 18-20 months, so its mother usually cannot breed again for two or three years and sometimes six years can elapse between calves. It is a long time before a young bottlenose dolphin reaches sexual maturity – between 8 and 15 years for males and 5-13 for females. However, both sexes can live for more than 25 years, and females have been known to live over 50 years, so she may give birth to several young in her lifetime. Bottlenose dolphins face a number of modern threats. Favouring sheltered bays and estuaries with an abundance of fish, they are vulnerable to inputs of pollutants; vessel collisions and sound disturbance from large numbers of pleasure craft; and accidental capture in fishing nets, particularly coastal set nets for salmon.